Contented chickens scratching up insects in the barnyard or crooning happily as they lay their eggs is the ideal situation every homesteader strives for. Sometimes this idyllic picture is torn in two when a hen or two show up with large bald patches where feathers used to be. When bald spots are caused by feather eating, take immediate action to prevent a potential fatality. Determine whether your chicken's feather loss is due to feather eating by careful observation. If the bald patch has bloody areas or scabs, it is most likely due to another chicken eating her feathers. Bald areas on the back of her neck and back may often signal rough or too-frequent mating. 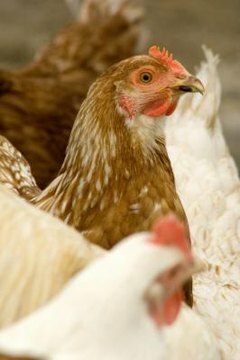 A bare patch on her chest is not unusual if she is sitting on a nest, as hens often pluck a spot to help them monitor egg temperature. A bare spot with red dots near her vent most frequently signals parasites. Feather picking usually occurs along the base of the tail and is accompanied by red, irritated skin. A victim of feather pecking can die within a day or two. Once the skin has been opened, other chickens will continue to pick at the victim whenever they see her. If possible, the hen will hide but will be too fearful to come out for food and water. Remove the victimized chicken to a cage by herself until her wounds have healed and the bald skin is no longer red. If keeping her apart is not practical, use veterinary antiseptic spray containing a blue stain on the bald skin to lessen its appeal to flock mates. There are a number of reasons why chickens will eat another's feathers. Very commonly, nutritional deficiencies are the cause. Make sure your hen's food has at least 16 percent protein -- switch feed if necessary. Provide a bowl of ground oyster shells separate from the feed so your chicken can supplement her calcium intake. Finally, adding 1 teaspoon of raw apple cider vinegar can provide potassium and trace minerals that may be causing her to seek out nutrition by consuming another chicken's feathers. Supplement their diet with lawn clippings, greens from the garden or table scraps. Feather eating commonly happens when chickens are overcrowded, bored or hot. Chickens kept in confined quarters peck one another more frequently than those who have access to free range where they can nibble plants and scratch for bugs. If your chickens must be confined, make sure you have 4 square feet of floor space per bird inside, with 10 square feet of outdoor space per bird. Provide one nest box for every three to five hens and 5 inches of feeder or roosting space. Spread straw or other deep litter on the floor and sprinkle scratch or other whole grain on the straw to give hens hours of foraging. Suspend a cabbage or ears of corn above floor level to satisfy pecking behavior in an appropriate manner.